Hello everyone, today I’m doing another school related post, since school is a week away or maybe you’ve just gone back! Anyway, I know how boring school is but I want to try and make this post exciting and make you want to pack your bag ready for school. 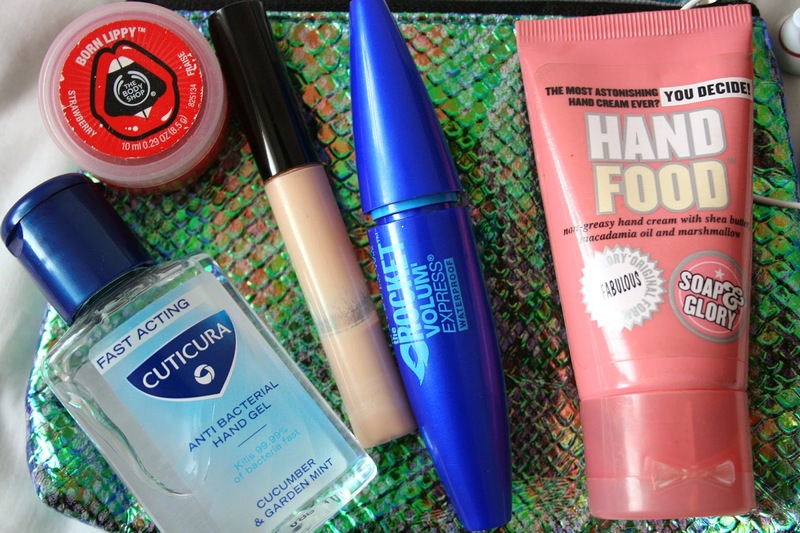 So this is some of my essentials, that you could add to your bag this year too! So to start off with, a pencil case. This is a super boring thing I know, but if you have everything, you feel organised and prepared. Even though its a small thing it can take off a little bit of stress because you know you don’t have to worry about borrowing someone else’s pen or not having a ruler for that test you have, etc. Next is just a body spray. This is something that you don’t have to spend much on at all since it’s just for your school bag. As you can see I have a charlie spray in ‘pink’. This was on offer in Boots for £1. I think having a body spray is a really useful thing, for example, after PE you might want to use some because you’ve done a lot of exercise or maybe you just want to freshen up! Also, headphones. I would be SO lost without my headphones, listening to music on the way to school or if you’re allowed in lessons, is such a calming way to start your day or keep you a little less stressed in any lessons you may be allowed to listen to music. Then lastly, my ‘make up’ kinda of essentials bag. I bought this small purse/make up bag from H&M, I love it so much. Its a metallic colour with a shiny material, its like a mermaids tail! Anyway, what I plan to keep in this is a hand sanitizer. Wow, where would I be without one of these. I used to have the Soap & Glory handmaid one, but I ran out. These are so super useful for school because of course all the stuff you touch at school other people have touched! I’m not a germ freak I promise, haha. Or I find it useful after Art and things where you have messy hands. Then there is lip balm, you never know when you’re going to need this! I just have the Body Shop Born Lippy in strawberry, because it smells AMAZING! Lip balm is so useful, especially going into the colder months when maybe your lips get a bit more dry. Concealer, this is a super useful thing to carry with you too! After PE when your make up has run a bit and you look tired out, this is a life saver to brighten under your eyes. Or even if you’re tired in the morning and you need to top up those tired eyes, this is something that will come in handy. Mascara is handy to have, again, after PE your make up may have run and you want to put some back on! Or a water proof mascara to put on before you do PE so it doesn’t end up running! Mascara is just one of those things, you’ll never know when you may need it! And last of all, hand cream. Not to sure on this one, I just like carrying it with me. When it gets colder your hands might get a bit dry and sore so having hand cream makes them feel 100x better and softer! 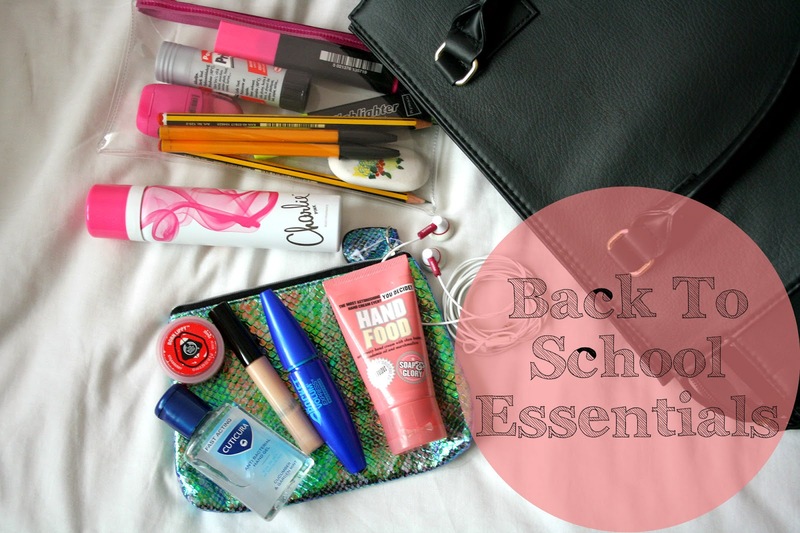 I hope this helped anyone going back to school, so what are your back to school essentials? Thanks for reading!